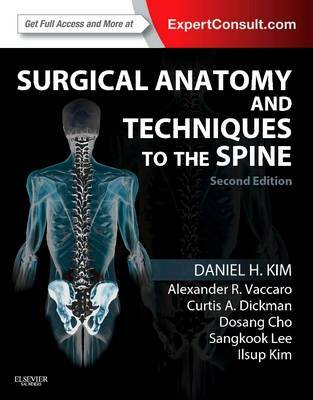 Featuring an expanded focus on in-demand endoscopic and minimally invasive spine procedures, Surgical Anatomy and Techniques to the Spine, 2nd Edition pairs new anatomic photographs and radiographic images with expertly rendered color illustrations and clear, step-by-step descriptions to help you effectively perform all of the latest and most effective spine surgery techniques. A multidisciplinary approach makes this medical reference book relevant and informative to all surgeons regardless of their specialty or level of surgical experience with the spine. Proceed with confidence. An atlas-style format featuring clear, concise, step-by-step descriptions of the anatomy and procedures along with clinical hints and pearls, tables, and management algorithms provideing swift answers and trusted guidance. Sharpen your surgical acumen with a deeper understanding of the anatomy of the surgical target and related anatomy. Comprehensive information on cervical, cervical/thoracic, thoracic/lumbar, lumbar spine, lumbar/pelvis, and other surgical locations ensures the best approaches to spine surgery and results. Understand the spine from all angles with multiple-viewpoint, full-color photographs, and illustrations. Master surgical anatomy of the spine and the latest minimally invasive techniques. Sweeping revisions and updates-including 22 new chapters-provide new and expanded coverage of spine surgery procedures and topics such as surgical management in gunshot wound to the spine, vertebroplasty, and kyphoplasty. Visualize every step of each procedure thanks to new anatomic photographs and radiographic images, corresponding with expertly rendered illustrations which more in-depth than ever before. Access the entire text and illustrations online, fully searchable, at Expert Consult. With over 60 additional contributors.